This picture book is aimed at 3-6 year olds, and has an innovative flip-format. It is a sequel to Smile Cry (which was released in 2017). 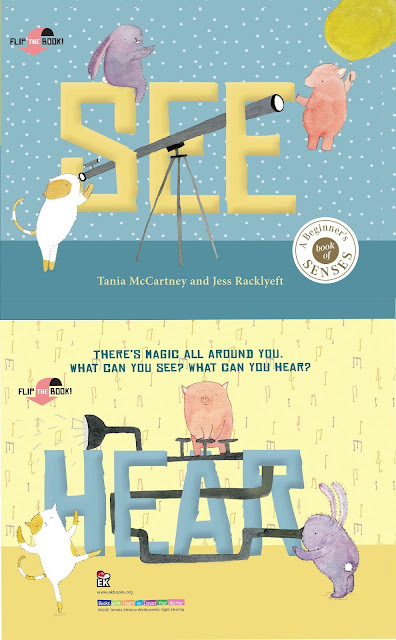 In See Hear, Piglet, Cat and Bunny return in an adventurous tale as they journey through the world around them and use their sense of sight and hearing to explore the magical moments of their lives. From seeing a gift-wrapped surprise to hearing buzzing blossoms, Piglet, Cat and Bunny engage in many adventures. This is a great beginner's book about the senses.